Welcome to your ocean front boutique hotel - the Brendon The Cool Place. 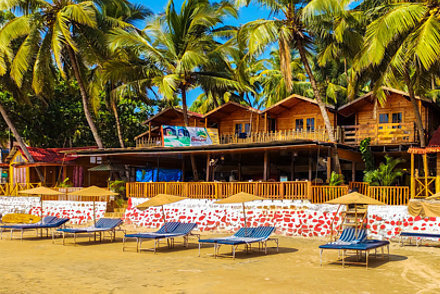 Set right on the white sands of Palolem beach are beautifully appointed and spacious wooden cottages overlooking the ocean. The Bar & Restaurant has 3 sitting areas - by the sea, the Lounge Bar or the sun beds were you can enjoy an amazing holiday suntan. The Lounge Bar is fitted with a giant screen were we regularly screen international football games including the English, Spanish, German football leagues live. The bar also has a small Library, Regulation Pool Table, Ping Pong Table and other board games. Also an exclusive area for Traditional Balinese and Ayurvedic Massage. We provide Free WiFi internet access for your laptops or smart phone throughout the hotel area and in all rooms. Leave your day to day stress behind and be pampered by our staff at Brendon The Cool Place. All cottages offer modern facilities like split air-conditioning, LCD television with satellite international channels like ESPN, Star Sport, MGM Movies, etc. A safe to keep your valuables, phone, fridge and a mini Bar. 24 hour instant hot water shower. If you feel adventurous we organise Dolphin tours, Snorkelling and Fishing Boat rides, plus tours to discover the Magnificent Churches, the Ancient Temples and the Forts. If you wish to but souvenirs tours to the Anjuna Flea Market or the Saturday Night Market can be arranged too. Brendon - The Cool Place is perfect for couples, singles, honeymooner and families. Our staff is well trained and with only 27 rooms, we are able to look after your every need.